"What is it? 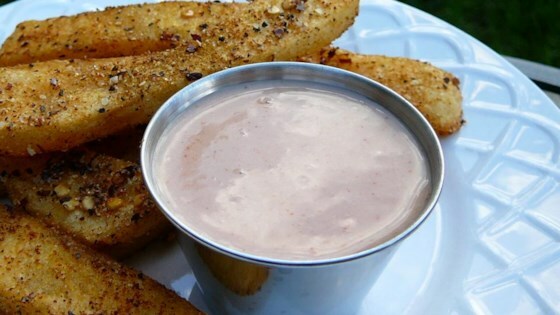 Fry sauce is commonly found in Utah, southern Idaho, and rural Oregon...I am trying to spread the word! This is an amazing recipe and after tasting this you will NEVER again settle for plain ketchup with fries." Whisk together 1 cup mayonnaise plus 2 tablespoons mayonnaise, sugar, salt, paprika, ground mustard, and onion powder until smooth. Stir in the ketchup, vinegar, and Worcestershire sauce until well blended. Cover and refrigerate until chilled, about 30 minutes. Store covered in refrigerator.